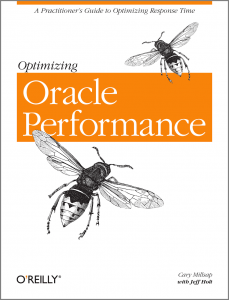 This is the book that started an Oracle performance revolution: Optimizing Oracle Performance, by 2004 Oracle Magazine Authors of the Year Cary Millsap and Jeff Holt. In this book, Cary and Jeff defined not just the new response time optimization method called Method R, but the very standard by which performance improvement projects themselves should be measured. The book’s three parts cover the scientific method for optimizing Oracle performance, the technical details that allow you to implement the method, and examples of the method implemented at real customer sites. Even though the book was published in 2003, the technical details it describes about Oracle Database systems and their underlying operating systems are true still today. If you are fed up with received wisdom that does not work, you recognize that performance tuning is a valuable skill for your business, and you wish to learn an effective scientific and repeatable approach to improving the performance of your business systems, don’t just buy this book but live it.